Located in an idyllic rural place, only about 12 km from the Plitvice Lakes national park, our recently opened boarding house welcomes you with its cosy family atmosphere. We offer accommodation throughout the year, serve traditional home-made specialties and provide an ideal base from which you can explore the beautiful countryside. A nice terrace to spend relaxing hours, a beautiful garden with playing equipment for children and a free private parking are available. 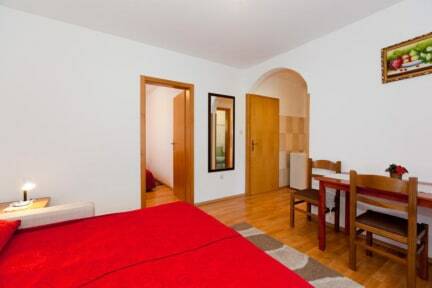 We offer you comfortable accommodation in daily cleaned soundproofed rooms and apartments (all with balconies). All rooms have private bathrooms and free of charge internet connection. The house is equipped with beautiful and functional furniture, which leaves warm impression. You can cater in our dining room (a vast selection of local specialties for breakfast and dinner: bread, ham, cheese, sausages, marmalades, grilled or roasted meat, vegetables...), on the terrace or in the summer house in the garden. The facility (having a surface of 30 square meters and adequate for up to 20 persons) is equipped with a stone fireplace and other equipment for food storage. Grilling or roasting various types of meat (lamb, suckling pig) or vegetables is available for guests in agreement with owner who will offer you free of charge a home-made plum or honey brandy as aperitif too. If cancelled up to 2 days before date of arrival, no fee will be charged. EUR 1 city/tourist tax per person per night is not included.